Poise. It’s the first word that comes to mind when describing second year pro Cooper Webb. Challenged with holding off Blake Baggett in moto one, Webb fended off the former champion for all of 30 plus two minutes. Until the final turn. The final jump. Baggett nipped the Yamalube/Star Yamaha rider by 0.80. It was a devastating loss for Webb and one that could have had lasting effects. Instead, Webb took the early lead in moto two from Christophe Pourcel and held off Baggett for more than 20 minutes—withstanding everything the Monster Energy/Pro Circuit rider threw at him. In the end, Baggett made a late mistake when he front wheel popped out of a rut causing him to drop his front end—that dropped him to third and caught Pourcel as well—which allowed Webb to cruise to his first career moto win and first overall. Justin Bogle was there to capitalize on Baggett’s mistake, and took second by more than six seconds over Baggett. Pourcel, despite his late tangle with Baggett finished fourth, with Marvin Musquin, Jeremy Martin, Dean Wilson, Cole Seely, Anthony Rodriguez and Jessy Nelson finishing out the top ten. It’s only his first year in 450MX, but Ken Roczen has shown to have the short memory it takes to become champion. After faltering late in the first moto and letting Ryan Dungey run away with the moto win, Roczen struck early in moto two, passing Dungey and capturing the overall with 2-1 scores to Dungey’s 1-2. It was another strong signal to the field that Roczen is in it for the long haul. For the second straight moto, Eli Tomac showed everyone what we’ve been missing. He filled in behind Dungey, and although he never made a serious run, he keep Trey Canard at arms length en route to a 3-3 performance for third overall in his 450MX debut. Trey Canard was off the pace of the leaders again, but never received a challenge from fifth. Weston Peick made a late run to catch and pass Josh Grant to capture fifth. 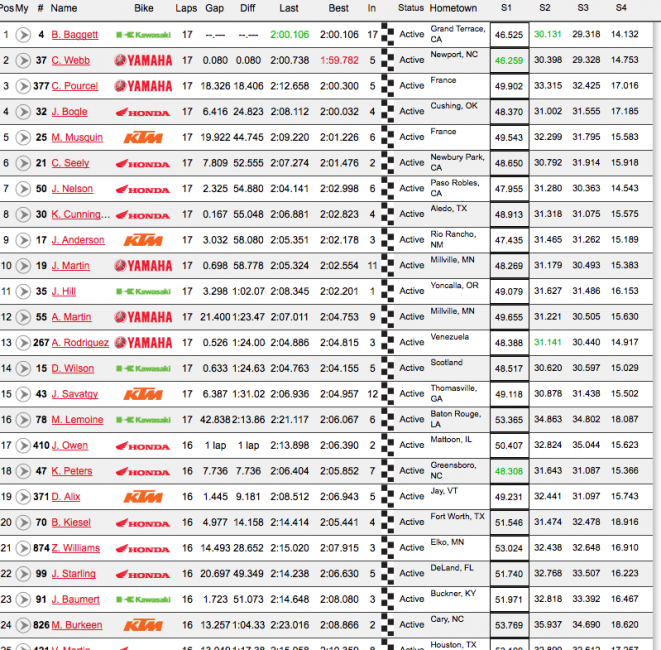 Brett Metcalfe, Andrew Short, Chad Reed and Malcolm Stewart would finish out the top ten. It was a hot and cold moto two for James Stewart. After getting caught in a first turn crash, Stewart fired through the pack working his way to ninth. While trying to chase down Andrew Short for eighth, Stewart swiped left, then right, before going down. Again, he was forced with a hole to dig out of. He was able to dig deep and worked his way to eleventh before motos end. 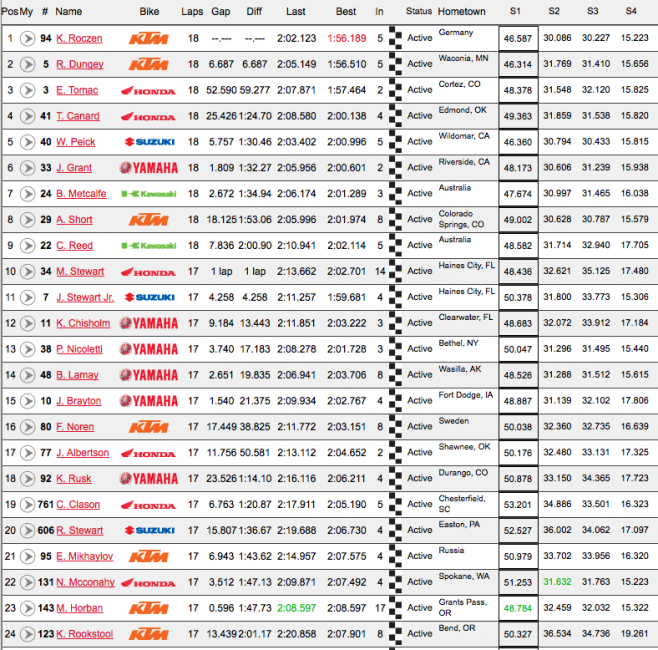 0.080 is all that separated Blake Baggett and Cooper Webb. In a drag race to the finish line—Baggett sweeping outside, Webb protecting the inside—Baggett beat out Webb by less than a wheel in an instant classic ending to moto one. In a battle of experience vs. youth, Webb showed his maturity—holding Baggett at bay for more than five minutes down the stretch. In the end, though, the experience of Baggett bled through, leading to the fourth straight moto win for the 2012 Champion. For the first time all season, Jeremy Martin had to face a real test. The points leader was caught in a first turn pileup, leaving him buried outside the top twenty. The pileup also collected Dean Wilson, who is back for the first time since Glen Helen. Martin rode great to work his way up to tenth, but that’s is as far as he would go. Another Yamaha rider, Christophe Pourcel had an exciting moto. The Frenchman jumped out to an early lead—trailed by Justin Hill, Justin Bogle and countryman Marvin Musquin, who suffered an early crash, only to fight back to fifth—and lead for a number of laps before faltering under the pressure of Webb and Baggett. Pourcel told us earlier this week that Baggett had something more than he did late in the race, but Pourcel was able to hold on for twenty minutes. Justin Bogle took fourth, with Musquin, Cole Seely, Jessy Nelson, Kyle Cunningham, Jason Anderson and Jeremy Martin rounding out the top 10. Two weeks ago, Ryan Dungey, in a tight battle with teammate Ken Roczen and Honda Muscle Milk’s Trey Canard, made two very uncharacteristic mistake late the both motos, costing him valuable championship points. The tables turned have turned. Dungey used clean, precise passes on Trey Canard, and then Eli Tomac, and using a late mistake from Roczen, won the first moto by fifteen seconds. Roczen, current 450MX points leader, was locked in tight with Dungey early, but this time it was he who would make the late mistake. It was costly, as he was never able to construct a run at Dungey after. GEICO Honda’s Eli Tomac entered 450MX with a bang. Sidelined for the first four rounds with a shoulder injury, the 2013 250MX Champion made his debut this weekend and promptly captured the Oakley Bomb award for the fastest lap in practice. In the first moto he slipped through to take the early lead, as Josh Grant and a host of others—including Malcolm Stewart, Chad Reed and Fredrik Noren—were involved in a first turn pileup. 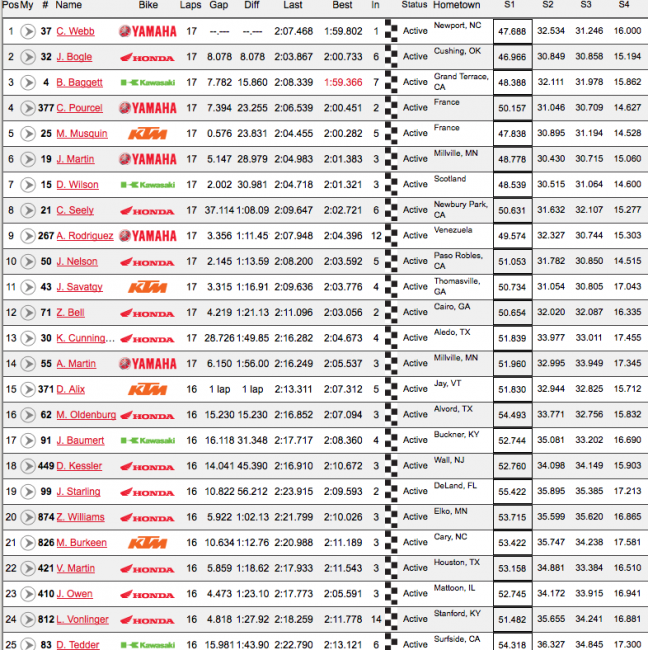 Tomac held the lead for a number of laps, but the pressure from Dungey and Roczen was too strong late. All eyes were focused on James Stewart entering the first moto. Buried off the start, Stewart switched into a different gear late. 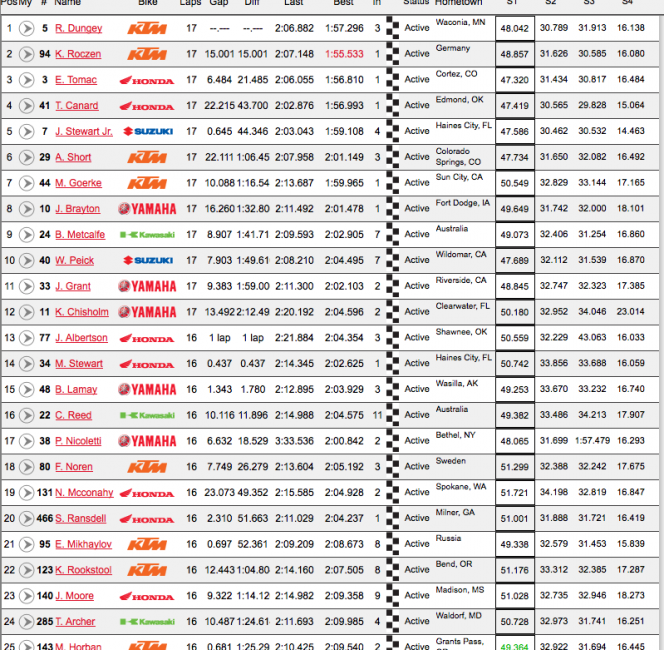 Moving quickly past Phil Nicoletti and Matt Goerke and into fifth. He then dropped the second fastest time (on that lap) late in the race to pull to within a second of Canard. Stewart was relentless, attacking Canard all the way to the final turn. But Canard held strong and captured fourth. Andrew Short, Matt Goerke, Justin Brayton, Brett Metcalfe and Weston Peick would round out the top ten. Josh Grant worked all the way to eleventh following a first turn crash. In their second year running a National, Muddy Creek Raceway brought in more than 1,200 tons of dirt to refurbish the track. The layout is the same, but you will notice a dark soil mixed in at various parts of the track. On press day Thursday, some riders noticed that the track had multiple soft spots. Amateurs ran the track yesterday, which has helped mix in the dirt. It appears the southern heat, which was expected to be a factor this week, will have little effect today. With highs only expected in the mid-80s, and overcast skies, riders will get a reprieve from the lower 90s and high humidity that was expected earlier this week. James Stewart, through a Suzuki PR representative, released a statement this morning addressing his positive test for an amphetamine following Seattle Supercross. (You can read the full statement here). Due to the ongoing investigation, this is all James is allowed to comment on at the moment. He will be racing today. In other news: superstars Eli Tomac (GEICO Honda) and Justin Brayton (JGR Yamaha) make their 2014 Lucas Oil Pro Motocross debuts today, while Monster Energy/Pro Circuit Kawasaki gets a boost with a returning Dean Wilson. And in his first career 450MX race, Eli Tomac picked up the Oakley Bomb award for the fastest lap set on the day. Eli told Race X on press day that “I could maybe run with the top guys or I could be back there in fifth or sixth. I guess we just have to find out Saturday.” Well, it looks like he is able to run with the top guys—in practice, anyways. Behind Tomac (1:57.344) was 450MX points leader Ken Roczen (1:58.290), Trey Canard (1:58.404), James Stewart (1:58.787) and Josh Grant (1:59.533). Justin Brayton was 20th overall in his return to racing. Christophe Pourcel told us earlier this week that it’s no coincidence that his fastest laps come toward the end of practice. Pourcel is calculated, and spends a majority of practice setting up lines and getting accustomed to the track. Today was different, though, as Pourcel was fast all day, in part due because he has a timer taped to his bars so he can concentrate on his lap times. Pourcel (1:58.809) was nearly two seconds faster than his countryman Marvin Musquin (2:00.446) and points leader Jeremy Martin (2:00.704).